Ernesto is here, and with it, wind and rain and cold: a much needed respite from the heat and drought. As I headed in to work, wearing a jacket for the first time since April, I noticed some commotion around the 1700 block of 18th St NW: fire engines, police cars, and lots of leaves and branches where there shouldn’t be leaves and branches. 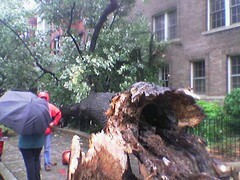 Ernesto’s winds had knocked over one of the block’s older denizens. 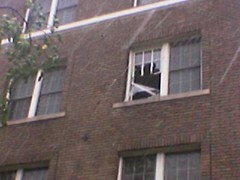 The tree took out a window, scratched up the front of the building, and came to rest blocking the front door. No one was hurt, thankfully, and city services were already attacking the fallen leviathan with mighty chainsaws. By workday’s end, a truck was carting off pieces of the old tree’s trunk, though signs of the chaos remained in shattered glass and a bent fence. I was thinking of checking out the new Trader Joe’s, but it was just too crazy windy out to walk, and the Orange Line was packed and delayed, so I just went home and got me some cream puffs.